In his latest education policy plan, Republican gubernatorial candidate Greg Abbott proposes giving school districts and parents more control of students' education by tossing out state mandates and regulations. Abbott’s plan, which he presented at Northbrook High School in Houston, proposes letting parents more easily petition the state’s education commissioner to change campus management of poorly rated schools, increasing parents’ access to school performance data, and offering school districts the ability to opt out of state mandates of day-to-day operations, including calendars, food and beverage services, and transportation. While the plan largely focuses on moving away from “centralized” control of school districts, it also proposes the creation of the Texas Achievement School District, which would take control of underperforming elementary schools from local districts and would be tasked with improving the schools' performance. The new district, which would be led by an independent superintendent who would have “broad discretion over personnel” and the school’s operations, would oversee the bottom 15 public or charter elementary schools in the state that have received an F rating under the Texas Education Agency’s accountability rating system for two consecutive years. On Wednesday, before Abbott released his proposal, the campaign of his Democratic opponent, Wendy Davis, went after the Republican over his choice of location for the announcement. Northbrook High School is part of Spring Branch ISD, which is among the more than two-thirds of Texas school districts that are fighting the state in an ongoing school finance lawsuit over $5.4 billion in spending cuts to public education that the Legislature made in 2011. As the state’s attorney general, Abbott has represented the state in the lawsuit against the school districts, which claim that the state’s funding system is inadequate. 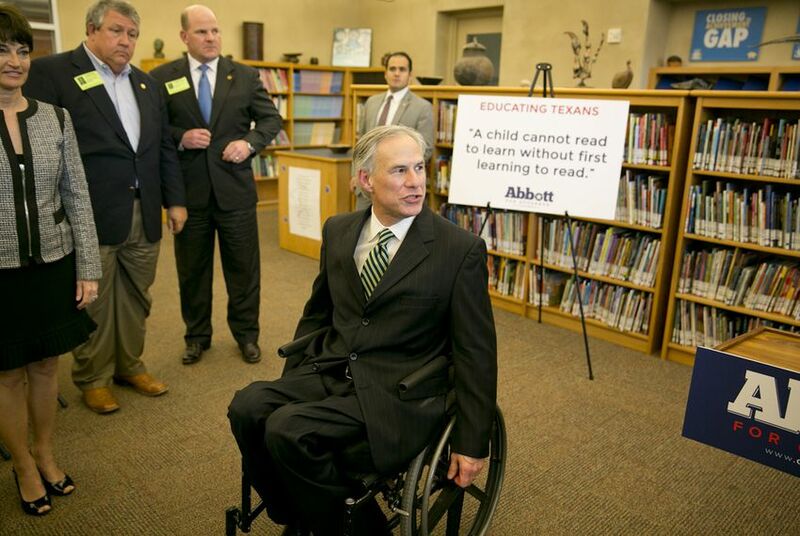 “Perhaps the problem is that Greg Abbott is having trouble locating a school district in the entire state of Texas that’s not currently fighting him in a courtroom lawsuit,” Davis spokesman Zac Petkanas said in a statement. Davis, who has attempted to make education a key issue in the governor’s race, has repeatedly criticized Abbott for defending the school finance system and has called on him to settle the suit. In his proposal, Abbott also calls for increased funding for teacher preparation programs. The plan recommends increasing support of teacher internship programs like UTeach, which recruits and trains undergraduates to become teachers. Abbott's proposal would provide up to $2 million in funding for the upcoming biennium “as needed” to promote the creation of similar programs. Abbott also proposed increasing state appropriations to the Texas Education Agency in the upcoming biennium from $12 million to $15 million to support Teach for America, which recruits college graduates to teach in underserved areas, and its expansion into other regions of the state.